The tournament management staff can use the check-in page as competitors check into the event for the first time. It lists all the competitor’s registration information and indicates if there is a total due for the entry. For each participant, the tournament management check-in page first displays the divisions the player is registered in. Next it will show the shirt size if the Yes option is selected in the tournament template setup. Then it will show all the fees the participant could owe, like entry fee, ref fee, late registration fee, additional items purchased during registration. Finally it will show the amount currently paid and the total due. 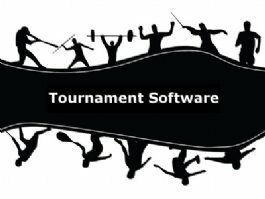 The tournament management can make comments regarding the player’s registration, and has the ability to print an entry receipt by clicking on the printer icon, or click the checkin link to check the participant into the event. This will take you to their registration online entry summary, where additional items can be added to the registration before final checkout. Checking them in will change the participant’s event check-in status on the tournament planner time grid when a match is selected. This is an important cross check for the tournament desk staff to make sure the participant has paid and signed their waiver before they begin to compete.